If you follow dog food trends, then you’re sure to be aware of the latest big one – grain-free dog food. The trend, which offers dog owners another type of diet for their dog, has resulted in an explosion in both production and sale of grain-free dog food products in recent years. But what exactly is this trend all about? And perhaps more importantly, is there any scientific proof behind it? Among other things, part of the rationale for the development of grain-free dog food is the idea that dogs are not built to digest grains or complex carbs – or in other words, they’re not built to break down starch. Because modern domestic dogs evolved from the grey wolf, there is a school of thought that dogs should only eat what wolves eat. Because that’s how they’re built. But as discussed in detail in the blog post ‘Is your dog a wolf’, this isn’t the case. Thousands of years of natural selection, coupled with living alongside humans, means dogs have evolved have the ability – both at the genetic and at the anatomical level – to break down grains and complex carbs – and the starch in them. But while this evidence discredits the fact that dogs can’t eat grains, it doesn’t mean that they should or shouldn’t. It simply means that if you choose to feed your dog grains, they will be able to digest and absorb nutrients from them. As I’ve said before and will say again – every dog’s dietary and nutritional needs are different, meaning every dog’s diet will be different. Another misconception surrounding grain-free dog-food is that grain-free means carb-free or low carb. Typically, in grain-free dog foods, the grains are substituted for other foods like potatoes, sweet potatoes, peas and apples, all of which are a source of carbohydrates. This means that very often, grain-free dog food has a similar – and sometimes higher – carbohydrate content compared to grain-inclusive diets. Again, this doesn’t mean you shouldn’t feed your dog a grain-free diet. Rather, it’s a cautionary note that if part of your reasoning for going grain-free is to also be carb-low, this isn’t always possible. 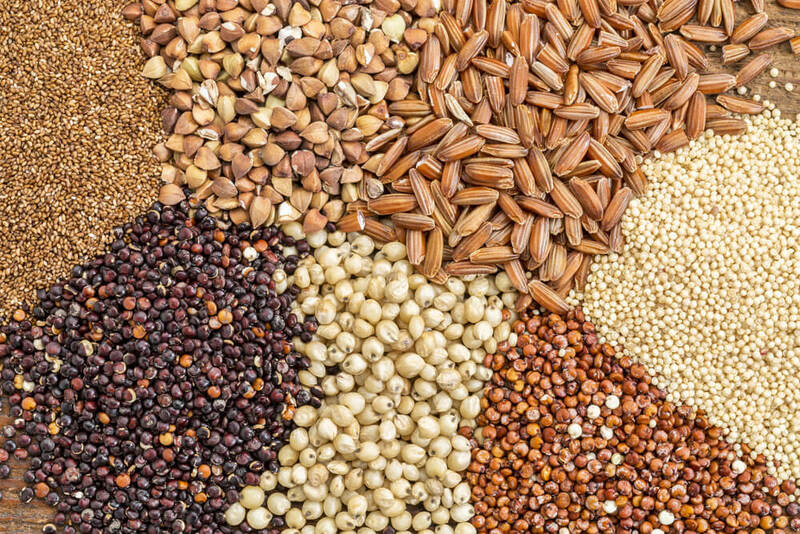 So remember – grain-free does not mean carb-low. Another reason grain-free canine diets are so popular is that people believe they are better for dogs with allergies. While food allergies are common among dogs, rice, corn and other grains are not the main allergens (a substance that causes an allergic reaction) that cause these reactions. It is in fact beef that is the most common cause of food allergies among dogs, with dairy coming in second. On the other hand corn, a specific type of grain, was found to be an allergen in only 1 in 7 dogs, making it one of the least common allergens among canines. It’s also worth noting that some dogs are allergic to foods like potatoes and sweet potato – the very things that are included in grain-free diets. If you suspect your dog is allergic to something, it’s best to speak to your vet before switching their diet or making changes to their lifestyle. That way, under professional care you can correctly determine which particular food your dog is allergic to. And if it turns out to be grains, then of course a grain-free diet is the way to go. Popular trend or science fact? There’s no denying that grain-free dog food and a grain-free diets can have their health benefits. However, it’s very important to remember that like most trends – be they in humans or dogs – the grain-free dog food trend arose because of demand from dog owners. That is, grain-free diets did not develop in response to new scientific research findings that demonstrated they should be adopted as a preferred diet for dogs. Instead, it was because dog owners wanted them. And that’s absolutely fine. Because it may well be that your dog not only receives all of the nutrients they need from a grain-free diet, but also thrives on it compared to a grain-inclusive diet. Equally, other dogs will not be happy on a grain-free diet and so should continue to eat grains. It’s all simply a matter of knowing your dog and talking to a nutritionist about what is the best, most nutritionally balanced diet for your dog. That way you can ensure, and be assured, that you’re feeding your dog the right diet for them, the diet that will keep them strong, healthy and happy. I’m sure you’ll agree that ultimately, this is what we all want for our dogs.